Ladies, are you struggling to find the perfect holster? 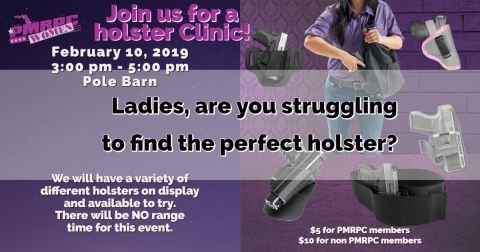 Join us for our holster Clinic! We will have a variety of different holsters on display and available to try. There will be NO range time for this event. Read more about PMRPC WOMEN holster Clinic! Please let Connie or Judy know if you will be attending thru Facebook or Email pmrpcwomen@pmrpc.com. It is important for us to get a headcount. RSVP no later then March 25. Participants may choose to attend any or all of the 3 events. Do you want a chance to stretch out and shoot your AR Rifle or carbine or similar rifle caliber platforms out to 200yds or 300yds at PMRPC? Using our Electronic Target system!!! power shooters. Good teachnig for novices or refresher for the pro. This will occur in the afternoon, post the morning Mid-Range/F-Class match. THERE NO FEES for the clinic!!!! Rain date will be Sunday September 13th, at same time. Unsupervised use of the Action Area requires attending an orientation session that explains the special rules and procedures. A new program for AA Orientation was recently implemented and all shooters in the AA are required to complete this new orientation program.